Dollar bulls have been charging lately and I have reason to believe that they would continue to do so, which means it’s time for me to cut losses on this USD/CHF short. 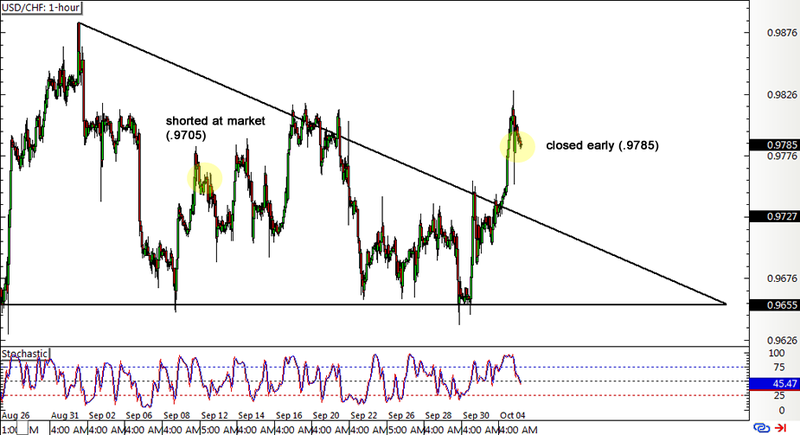 In my initial trade idea, I was watching a longer-term descending channel on USD/CHF and thought that I was able to catch the bearish momentum when resistance held. However, dollar bears just didn’t seem to have it in them, causing the pair to consolidate in a triangle formation with support around the .9650 minor psychological level. I figured that I’d watch this consolidation pattern closely, gauging where the pair could be headed in the long-term based on which direction price would break out. A break below the .9650 support would convince me to keep this short position while a break past the resistance around .9750 would lead me to exit early. Data from the U.S. economy has been coming in mostly stronger than expected so far this week, particularly the ISM manufacturing PMI which rose from 49.4 to 51.5. The employment component was still below 50.0 but it showed a slower pace of contraction in September, leading most forex junkies to predict that the upcoming NFP release will show a similar result. The ISM non-manufacturing PMI is up for release and an even stronger increase from 51.4 to 53.1 is eyed, likely driving the dollar much higher on expectations of a Fed rate hike sooner rather than later. With that, I decided it was time to exit early and reduce my potential losses on this trade.